All the world’s a stage, and all our park’s a picnic during our fifth annual competitive picnicking event, sponsored by Janssen’s Market (your one-stop shop for proper picnic essentials). 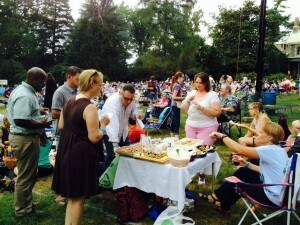 A “picnic” consists of any number of people gathering together to enjoy a good nosh and a great show. Picnickers entering the competition may register in advance (by sending an email to info@delshakes.org) or at the Summer Festival box office. The gates of Delaware Shakespeare will open 15 minutes early on July 22 (at 6pm) for registered picnickers to set up their spread and get ready to rumble. Each registered picnic will receive a number that should be displayed somewhere visible for the judges to see. Please remember that picnics, unlike P2P tailgates, should stick close to the ground, so people behind competing picnics can still see the show once it begins. If the performance is cancelled due to weather, Picnic Contest will be rescheduled for Saturday, July 29. The winning picnic will be announced during the curtain speech prior to the performance. Winners will receive an appropriately Shakespearean token of appreciation, a $50 Gift Card to Janssen’s Markets, tickets to the 2017 Delaware Shakespeare Summer Festival — and all the bragging rights they can handle.